Carmen Blandin Tarleton almost didn't receive a new face. 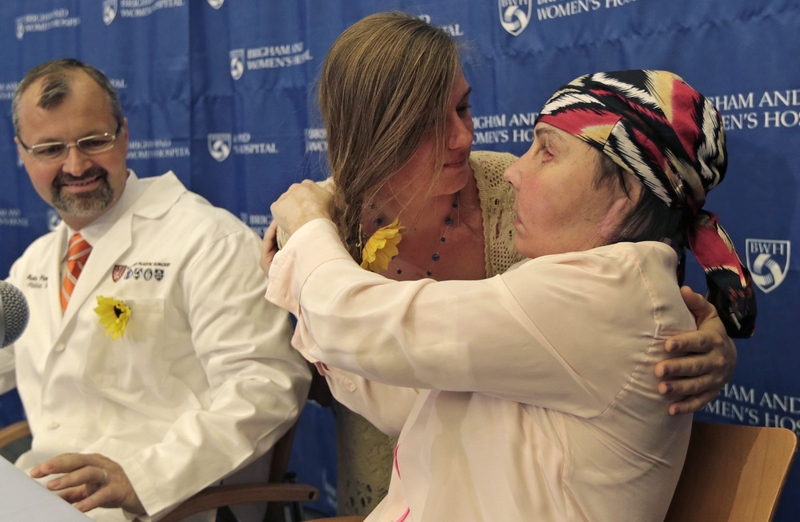 The odds of the transplant being successful were stacked against her, but thanks to her perseverance and the medical team at Brigham and Women's Hospital, it looks like the woman who was a victim of a vicious attack will able to smile and kiss her boyfriend one day. "She told me, 'I've gone so far. I'm not willing to go back. I'm willing to take all the risks even if I'm going to die," Dr. Bohdan Pomahac, Tarleton's doctor and director of the burn center and plastic surgery transplantation at Brigham and Women's Hospital, recalled to CBSNews.com. Tarleton was brutally attacked by her ex-husband with industrial-strength lye on June 10, 2007, causing burns over 80 percent of her body. In the five years since the incident, she's endured more than 50 surgeries. While doctors were able to restore some of her sight, her face and skin were badly damaged. Tarleton was also in constant pain because of the pulling of her scar tissue. Because the scar tissue is tight, she was unable to control her lips and had problems with drooling. The scars on her neck made it nearly impossible for her to turn her head or lift her chin. Tarleton was approved for a facial transplant surgery in December 2011, but doctors struggled to find her a donor. Because Tarleton had gone through so many surgeries, she had built up many antibodies, an intense immune system response from the invasive procedures. She had also given birth, and the introduction of foreign DNA also causes the body to build up immune responses. Her immune system was so sensitized that doctors determined she wouldn't match 98 percent of potential donors. Pomahac compared her situation to someone who gets infected with the same disease multiple times. "If you get an immunization as a child for polio and if you get infected five years later, you create memory cells," Pomahac explained. 'The second time around you get infected, the response is way more forceful." To test for a potential donor within that 1 to 2 percent who would work for Tarleton, the doctors had to first find a person who had the same blood type. Then using a sample of serum from Tarleton, they checked to see if her lymphocytes, a type of white blood cell in the immune system, would work with the potential donor's lymphocytes. Finally, doctors had to see if her antibodies would target and attack the donor's skin. "These patients have previously been called untransplantable and taken off the waitlist," Pomahac admitted. When they tested the eventual donor, Cheryl Denelli Righter, Tarleton's lymphocytes were compatible. However, her antibodies were "extremely reactive" to Righter's, according to Pomahac. Despite having only meeting two of the three criteria, the medical team decided to go for it. Pomahac decided to keep Tarleton's scarred face so they could have something to re-transplant in case she rejected the donor face. The 15-hour procedure enlisted the efforts of more than 30 medical staff. Pomahac wasn't worried about the technical part of the surgery, which is something he's done many times before. What he was concerned about was Tarleton rejecting the face. In his experience, all patients develop some form of rejection, but depending on how severe it is, could mean if they get to keep their new face or have to go back to their old one. With their fingers crossed, Tarleton made it through the first week, and then was managing without strong immunosuppressant drugs. However, she quickly began to reject the transplant, and the various attempts doctors tried did not stop her body's attack on the foreign face. "After a month of this, we're really running out of options," he pointed out. "We've tried everything. Even though the face looks okay -- no necrosis (death of body tissue) and only a little bit of swelling -- it was in an unstable state of rejection. " There was only one medication left, alemtuzumab. Alemtuzumab is typically used for the treatment of some types of leukemias and lymphomas, but it has been utilized for bone marrow, kidney and islet cell transplants. While the medication would stop rejection, the problem was it would also completely block Tarleton's ability to fight off any infection. A full dose carries a mortality rate of 20 percent. "I wanted her to be ready for it (rejection)," he said. "I told her I can always restore you to your original transplant... but she said, 'I'm not giving up. I'd rather die.'" After consulting with Brigham and Women's Hospital ethics' team, the doctors decided to give Tarleton a quarter of the dose to see if it would work. Surprisingly it did. "Somehow, that was enough, probably in the context of everything she's been given before," he said. Two weeks later, Tarleton was able to stop alemtuzumab, and is now on regular maintenance medication and has not shown any signs of rejection. Before the surgery, Tarleton could only move the right side of her face and had no control over her lower lip. Now, she feels slight tingling and twitches on both sides of her face. The doctor believes that she'll be able to regain sensation, to the point that she can feel being touched and even feel the inside of her mouth. She's even beginning to pucker her lips. "I can't wait until the day she smiles," he said. "That's the most rewarding for me." Pomahac says there's more to learn from Tarleton's case than just the strength one one woman to survive. With face transplants, doctors are learning more about the human body. For example, they can see how a face transplant patient learns to smile again and how that process rewires the brain, which may provide invaluable information to stroke victims. They're also learning more about the tolerance of the immune system and how to change the immune response to stop the body from seeing transplanted organs as foreign. Best of all, because the skin is an external organ as opposed to other implanted organs like kidneys, they're learning more about rejection, and can see the problems as they occur. "It's one of the most innovative surgical fields, and we have brought a lot of new interesting things to the table from microsurgery to this (facial transplants," he said. "I think it almost deserves a new name. It's really restorative surgery rather than plastic surgery."